The Mighty Mule MM562 is designed for dual swing gates up to a maximum of 18 ft. Long or maximum weight of 850 lbs. Per gate leaf for all gate types of gates including chain link, tube, panel, vinyl and wood. Most popular uses include dual ornamental driveway gates or large agricultural gates that are exceptionally large or in demand of high cycle (open/close) installations. 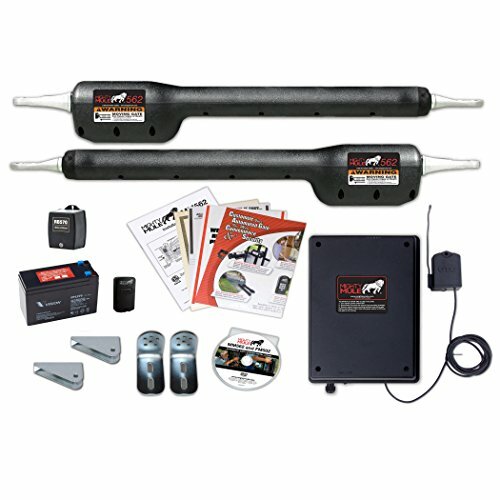 The MM562 is Mighty mule’s strongest and most durable gate opener that can be utilized for many applications including residential, agricultural, farm & ranch, etc. The MM562 and all Mighty Mule automatic gate Openers are solar capable with the addition of a Mighty Mule 5-watt solar panel (model # Fm121) or 10-watt solar panel (model # Fm123). this opener comes equipped with Mighty mule’s exclusive dual sense technology, this meets ul325’s 6th edition standards for additional protection & safety. The Mighty Mule dual sense technology provides users with additional safety and precaution without the need of secondary entrapment device, such as photo eye sensors (model # R4222). please note that all gate opener installations are unique and may require additional protection devices based on the type of installation. The MM562 kit includes everything you need for installation including the MM562 gate operator, battery box with control board, 1 single button remote (model # Fm135), AC transformer (model # RB570), 12-volt 7 amp-hour battery (model # Fm150), all required hardware and a detailed installation manual with an interactive DVD for ease of installation. The MM562 provides an installation DVD & unlimited access to 24 hour technical support and is backed by a 18 month Mighty Mule warranty and technical support. Additional accessories such as remote controls (model # Fm134 or Fm135), keypads (model # Fm136 or Fm137), solar panels (model # Fm121 or Fm123) and vehicle exit sensors (model # Fm138, Fm140, Fm141 or Fm130) all can be purchased on Amazon.Com. The new MM562 features Mighty Mule's exclusive Dual Sense Technology that meets UL325 6th Edition Standards for additional protection & safety. Designed for heavy duty dual swing gates up to a maximum of 18 ft. long or maximum of weight of 850 lbs. per gate leaf. Ideal for the DIY (Do It Yourself) property owner, the MM562 comes equipped with detailed instructions, installation DVD & unlimited access to 24 hour technical support. Perfect for all dual gate types including ornamental, chain link, tube, panel, vinyl and wood. Includes: single button remote (Model # FM135), AC transformer (Model # RB570), 12-volt 7 amp-hour battery (Model # FM150), control box, all required hardware and a detailed installation manual with an interactive DVD. Solar Capable: With the addition of a Mighty Mule 5-watt Solar Panel (Model # FM121) or 10-watt solar panel (Model # FM123). Backed by a 18 month Mighty Mule Warranty and Technical Support.